SBCAG offers a variety of commuter services through its Traffic Solutions division. Santa Barbara County's regional rideshare organization, Traffic Solutions encourages commuters to choose commuting options other than driving to work alone through marketing and public outreach, incentive programs, and by acting as an information resource. Call the Traffic Solutions help line at 963-SAVE for information about carpooling, vanpooling, biking, or to have a free Santa Barbara County bike or transit map sent to you. 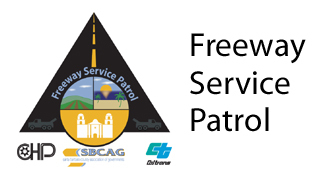 The Freeway Service Patrol (FSP) program is a free service provided by the Santa Barbara County Association of Governments (SBCAG), the California Highway Patrol (CHP) and Caltrans. FSP is composed of a fleet of tow and service trucks that patrol designated routes of Highway 101 on the south coast corridor. The service is provided Monday through Friday during peak commute hours. Share a ride with a carpool partner or group and save big! You'll save gas, wear and tear on your car, the environment and money! A vanpool is a group of seven to fifteen people who live more than twenty miles from work and commute together on a regular basis in a van. Some vanpools are company sponsored, others are rented month to month from vRide (formerly VPSI), Enterprise Rideshare, or CalVans, and some are owned by the drivers. Telecommuting simply means performing your normal work duties at a location away from the conventional office. This remote location can be your home or an office closer to home. Telecommuting can occur in many different forms. Most telecommuters do it once or twice a week. Some telecommuters do it nearly every day, rarely venturing into the office. And some people just telecommute occasionally, in order to meet an important deadline without office interruptions. Register for the Emergency Ride Home Program and if you have an emergency and need a ride home from work on a day that you used alternative transportation, call a taxi or the car rental company of your choice. Pay for your ride home (don’t forget to ask for a receipt) and submit the online reimbursement form, print out the form and mail in your form with the receipt to Traffic Solutions.